The healing mask recipe below offers distinct advantages to your current cosmetic routine: it makes use of organic ingredients (to guarantee your peace of mind) and is reliant on ‘DIY industriousness’ (to confirm your belief in yourself). 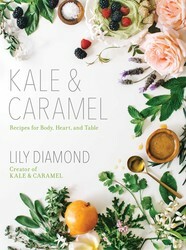 Learn more from Lily Diamond’s Kale & Caramel to invigorate your body and feel more confident. Though I love the flavor of raw honey, I’m far more enamored with its power to soothe and rejuvenate even the most tired and dull skin—and thus begins my official Campaign or Honey as Skincare President™. I’ve received countless emails from friends and grateful Kale & Caramel readers whose skin completely transformed after they started using honey as face wash. This healing mask takes the soothing quotient to the next level with freshly crushed basil leaves and juicy blackberries. Basil, in its many forms, has long been revered for its healing properties in India, where it’s known to soothe everything from digestion to inflammation. This mask applies fresh basil leaves directly to the skin, allowing the herb to work its magic alongside the antibacterial, anti-aging powers of raw honey. Blackberries join the party to tone the skin with gentle fruit acids and vitamin C.
Together, these three ingredients form the foundation of a skin treatment that proves you need look no further than your fridge to get your glow on. In a small bowl, crush the blackberries and strain out the juice into a second bowl. 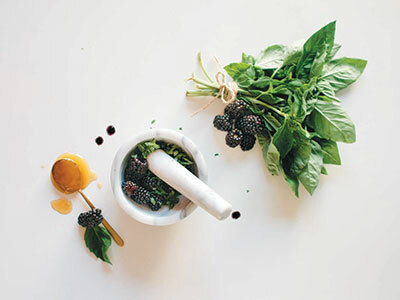 Add the honey and basil to the blackberry juice and stir to combine, using pressure to crush the basil into the honey. When fully incorporated, spread 11/2 teaspoons onto clean skin and let sit for 5 to 10 minutes. Then wash off completely and follow with toning spritz. Store the remainder in an airtight container in the fridge for up to 1 week. Now that your skin is clear and rejuvenated, be sure to protect it from the summer sun. Born out of the popular blog Kale & Caramel, this sumptuously photographed and beautifully written cookbook presents eighty recipes for delicious vegan and vegetarian dishes featuring herbs and flowers, as well as luxurious do-it-yourself beauty products. Plant-whisperer, writer, and photographer Lily Diamond believes that herbs and flowers have the power to nourish inside and out.